Most of us start our day with a cup of coffee. As the warmth of your first cup of coffee in the morning envelops you, it also destroys your enamel (the hard outer layer of each tooth). Made up of different minerals, enamel protects the inner layers of our teeth. Because it does not contain any living cells, enamel cannot regenerate. Once your teeth’s enamel is gone, it’s gone for good, and drinking coffee contributes to that. What Exactly Does Coffee Do To Our Teeth? As mentioned, coffee wreaks havoc on our enamel. Besides ruining the protective layer that covers the inside of our teeth, coffee also creates stains. When we drink coffee, it gets into the tiny ridges and holes in our teeth. This causes discolouration, brown spots and, of course, weakened enamel. Coffee is a highly acidic beverage, and the more we drink it, the more damage we are doing to our teeth. But you don’t have to give up coffee altogether if you maintain your oral hygiene. Caffeine is a stimulant, which is why we’re often not satisfied with just one cup. However, it does have some health benefits, like boosting metabolism and reducing the risks of cancer, diabetes and heart disease. If you can keep your coffee consumption to no more than five cups per day, you can enjoy its health benefits without doing major damage to your teeth. Wait 30 minutes before brushing: Drinks that are high in acid (wine, lemonade, coffee, soda) can soften our enamel. If you brush your teeth immediately after drinking coffee, it can further damage the enamel and the dentin that lies underneath it (the layer of tissue that lives under the enamel). 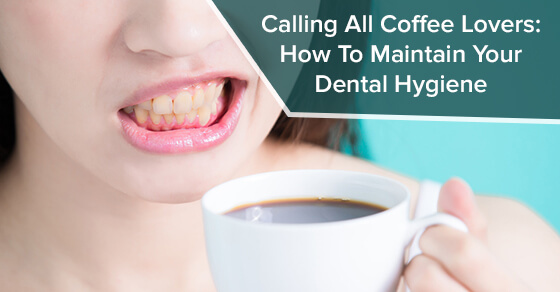 If you wait 30 minutes after drinking coffee before brushing your teeth, you are giving the enamel a chance to harden again to protect the dentin. Drink water: You should already be drinking water throughout the day to keep hydrated, and after coffee is no exception. After you’ve finished a cup of coffee, drink plain water to rinse your teeth off. The water will act as a buffer to the acid in the coffee that is now in your saliva. Use a straw: Drinking iced coffee through a straw may seem like a no-brainer, whereas drinking hot coffee through a straw may seem unnatural. However, drinking coffee (at any temperature) through a straw helps keep stains away. When you use a straw, you are bypassing your teeth and the acid from the coffee doesn’t have a chance to stain and ruin your enamel. Drink, don’t sip: You don’t have to chug your coffee, but taking leisurely sips can result in more staining. The faster you drink your coffee, the less acid you’re exposing your teeth to. Use an electric toothbrush: Electric toothbrushes are more effective at removing surface stains from our teeth than manual ones. Furthermore, electric toothbrushes do the work for you, and some even come with timers so you know you’re brushing your teeth for the Canadian Dental Association’s recommended 2-4 minutes. Get your teeth professionally whitened: If the coffee stains are highly visible, you can have your teeth whitened. Do not use an over-the-counter product. Instead, visit your dentist and have your teeth professionally whitened. Drugstore whiteners are not as effective and can actually damage your gums. Visit your dentist regularly: You should get your teeth professionally cleaned about every six months. Moreover, a professional cleaning can remove some surface stains caused by coffee. Your dentist will also check for signs of gum disease and other oral problems, and come up with treatment plans (if necessary) to ensure your mouth is in good health. Brush, floss and use mouthwash: Brush your teeth twice a day and make sure to incorporate flossing (once a day) and mouthwash (after you brush) into your tooth brushing routine. Your dentist can recommend a mouthwash for you to use and show you the proper way to floss (if you don’t know how to do it already). If you follow the above tips, you’ll be able to have your coffee and enjoy it too. Please contact Dawson Dental for more information about professional teeth whitening and dental cleanings or to make an appointment.